Project Description: Capture the magic of the holidays on paper! With fun to use Grafix products, it’s easy to create scrapbook pages of all your favorite moments. 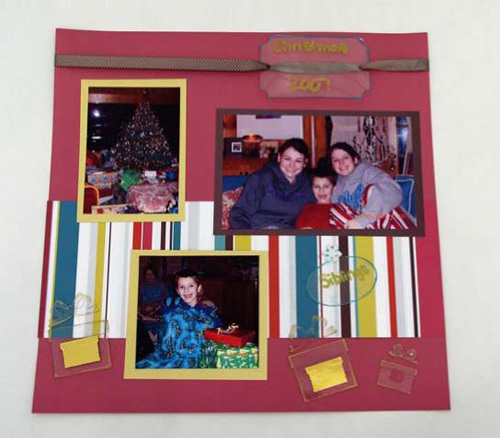 Layer photos on patterned paper and colored cardstock. Mount to page with Grafix Double Tack. Using decorative die cuts punch out gift tag, present, and ornament shapes from Grafix Craft Plastic. Add color to die cut shapes by brushing edge with teal and gold stamp pads. Add text with Permapaque markers. Secure Grafix Craft Plastic embellishments to page with Grafix Double Tack, brads, and ribbon.